The EU's "relative silence" about the kind of post-Brexit relations it wants with the UK must end, Philip Hammond is to tell German business leaders. There is "little, if any signal" from the EU about its priorities for talks on future co-operation due to begin in March, the chancellor is claiming. "They say it takes two to tango," he will say in in Berlin. "Both sides need to be clear about what they want." The EU has warned the UK cannot cherry-pick the kind of arrangement it wants. The second phase of Brexit negotiations, covering transitional arrangements after the UK leaves in March 2019 and future economic and security co-operation, are set to begin officially in March. However, internal discussions within the EU about the framework of future relations have already begun following December's first-phase agreement on so-called divorce issues, like money and citizens' rights. 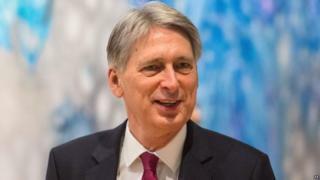 Mr Hammond and Brexit Secretary David Davis are aiming to lay down a marker for the talks ahead when they address the Die Welt Economic Summit. In his speech, the chancellor will say the EU must "put behind" it any talk of punishing the UK for voting to leave the 28-member bloc and concentrate on maximising the mutual benefits of close co-operation in areas such as defence, education, science, technology and culture. "I know the repeated complaint from Brussels has been that the UK "hasn't made up its mind what type of relationship it wants," he will say. "But in London, many feel that we have little, if any, signal of what future relationship the EU27 would like to have with a post-Brexit Britain." Earlier on Wednesday, in a joint-article for the Frankfurter Allgemeine newspaper, the two men argued that financial services were pivotal to the "bespoke" Brexit trade deal wanted by the UK. They acknowledge that their stated objective of leaving the EU's internal market and customs union means the UK will not be able to enjoy all the benefits it currently does as a member of the EU after leaving. He is taking his message to the heart of Europe. In a speech to business leaders in Berlin tonight, the chancellor will say it is time for the European Union to engage more positively in the Brexit negotiations. And stop talking about "punishing" the UK over Brexit. After months of grumpy noises from Brussels over a perceived lack of clarity from the UK, Philip Hammond will say that Britain needs to hear about the ambition the EU has for a deep trading relationship with the UK. My sources point out that with Australia, Canada and America all making positive overtures about free trade agreements with Britain, the lack of a similar offer from the EU could lead to unintended consequences. Logically, "no deal" could be one of those. And certainly the present tone of the debate from the EU is damaging the chances of a positive outcome of the Brexit negotiations, my sources say. But they insist the EU's desire to protect the integrity of the single market for its other 27 members is "not inconsistent" with the UK's desire for the most comprehensive agreement possible. "It makes no sense to either Germany or Britain to put in place unnecessary barriers to trade in goods and services that would only damage businesses and economic growth on both sides of the Channel," they write. "So as Brexit talks now turn to trade, the UK will look to negotiate a new economic partnership with the EU - the most ambitious in the world - that recognises the extraordinary levels of interconnectedness and co-operation that already exist between us. "We should use the imagination and ingenuity that our two countries and the EU have shown in the past, to craft a bespoke solution." The UK's preferred model for a post-Brexit deal is what Mr Davis has described as Canada plus, plus, plus - a reference to Canada's low-tariff free trade deal with the EU but with services included as well as goods. The two men make clear in the article that unrestricted trade in services - which makes up about 80% of the UK economy - will be pivotal to any successful deal, as will financial and regulatory co-operation within Europe. The EU's chief negotiator, Michel Barnier, has warned the UK it cannot hope to get a special deal for the City of London and that its options have narrowed as a result of it turning its back on the single market. UK-based banks and financial firms are worried they will lose the passporting rights that allow them to trade freely in the EU after Brexit - an outcome that is likely to see firms moving jobs to the continent. Separately, International Trade Secretary Liam Fox has urged Conservative backbenchers to not view everything through the "prism of Brexit", says BBC political correspondent Iain Watson. Dr Fox told the 1922 Committee of backbench Tory MPs on Wednesday to focus on the "bigger picture", pointing to an increase in UK manufacturing orders and expectations that the economy will grow in the next quarter. He said there was a political danger in suggesting events were "because of" or "despite" Brexit because the government could lose credit for the economic recovery - that it would not "own" the recovery. He is also believed to have told his Conservative colleagues that Labour remained in a state of confusion on Brexit and that some of their voting record on the withdrawal bill could be used as a weapon against them in key constituencies.